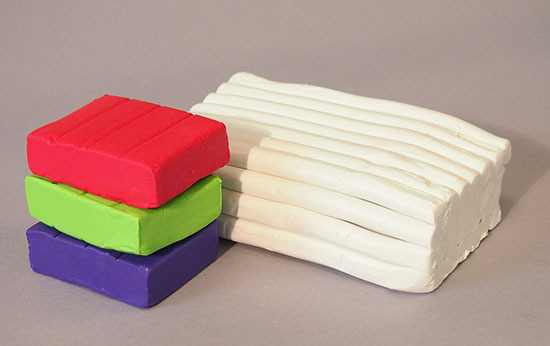 Imagine a material that has the pliability of clay and the color range of paint. One that is readily accessible, requiring no specialized equipment to unleash its creative potential. 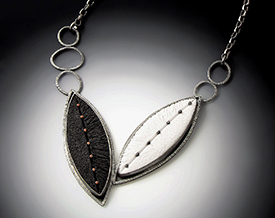 That material is polymer clay—and jewelry artists are using it to craft pieces unlike anything else. 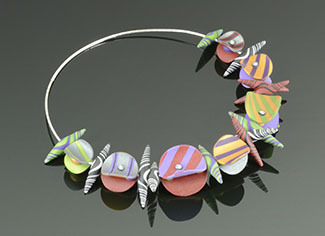 Louise Fischer Cozzi infuses polymer clay with oil paint and colored graphite to create her Quad Crescent Necklace. Though it’s known as “clay,” polymer is actually a kind of plastic—it’s a relatively new medium that has been around for less than 50 years. It is available in an extensive range of colors that can be further blended for a nearly limitless palette. It is soft and malleable like clay, yet doesn’t require the high heat of a kiln to cure—a kitchen oven works just fine. 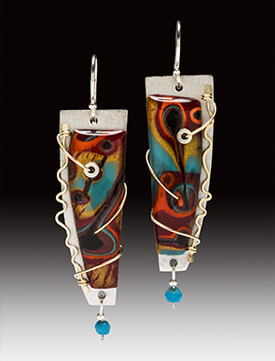 For those artists interested in blazing new trails and exploring the vast potential of a versatile medium, polymer clay offers incredible possibilities. As they explore and experiment, artists borrow ideas and techniques from other disciplines—ceramics, glass, metals—and invent their own. 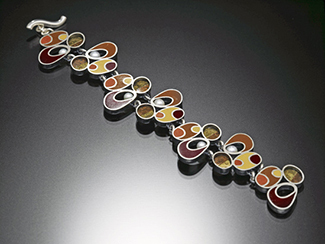 This combination of old and new, traditional and experimental is evident in the remarkable pieces these artists create. 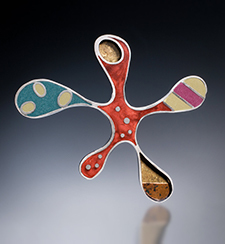 Great innovators in polymer clay, Steven Ford and David Forlano work collaboratively, passing pieces back and forth at different stages to create bold, unexpected work. They are especially interested in complex, layered surfaces reminiscent of organic materials. 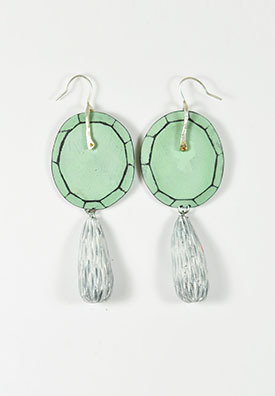 Lindsay Locatelli’s work features bright colors, bold textures, and simple yet dynamic forms. 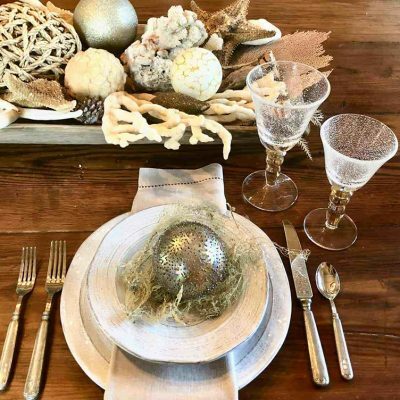 Inspired by the spirit of landscapes and other subjects, she finishes her polymer pieces with acrylic paint, then lightly sands them to expose the color underneath. The results are striking and textural. 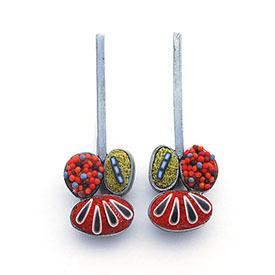 Arden Bardol creates bold, colorful earrings using intricately patterned polymer clay. 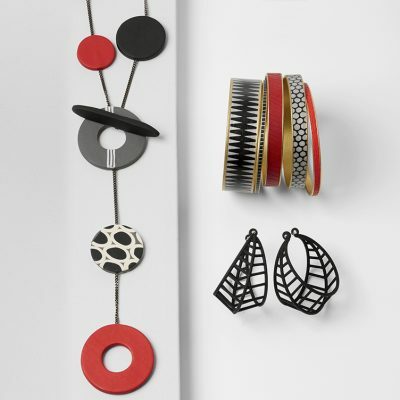 Describing her work as “rich in complexity and simple in form,” Arden Bardol draws upon her background in both ceramics and architecture to inform her vibrant polymer jewelry. She works with her own custom-blended polymer, often mixing it with metal powders to create unique effects. 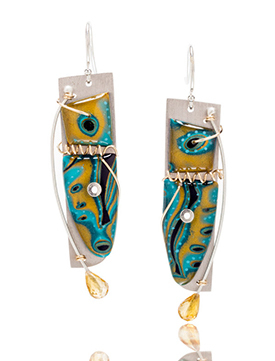 Sue Savage’s intricate designs are inspired by mokume gane, a traditional Japanese metalworking technique. 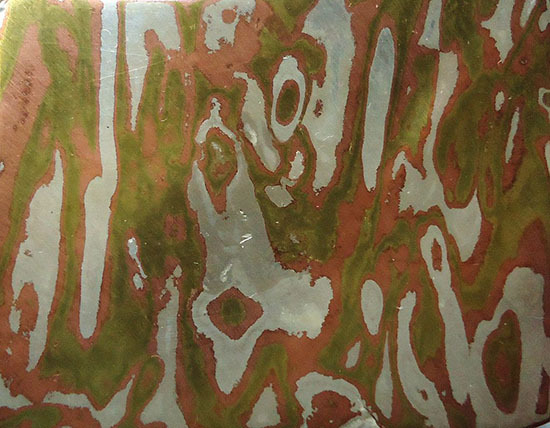 Traditional mokume gane in metal. Photo by Mauro Cateb (via Wikimedia Commons). Mokume gane is characterized by wavy patterns reminiscent of woodgrain, which are created by layering and working several different types of metal. 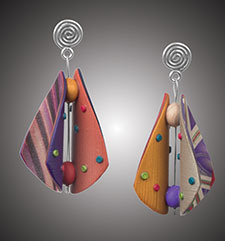 Savage reinterprets this technique in a novel way, creating similarly dazzling effects in the brilliant colors of polymer clay. Bonnie Bishoff and J.M. 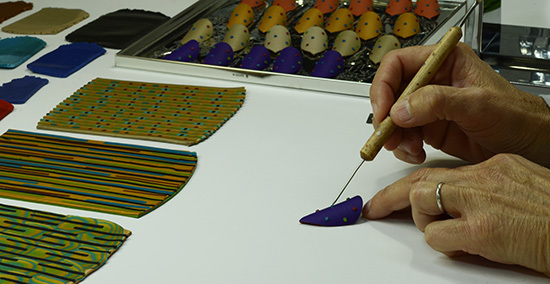 Syron use caneworking techniques similar to those used in glass, forming patterned discs or millifiori that are then set into metal to create vibrant pins. Whether in polymer or glass, caneworking techniques involve placing two or more pieces of material together, rolling them into a long rod or “cane,” then slicing the cane into individual cross sections (picture slicing a loaf of bread). 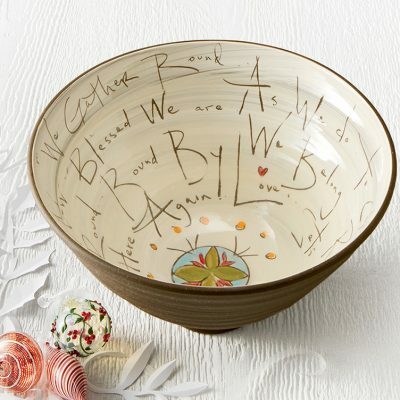 Every slice has the same image or pattern on it, allowing artists to create repeating designs. 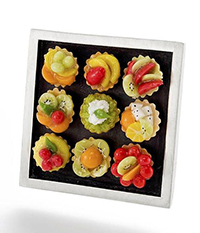 These slices are often referred to as murrini or millefiori (“thousand flowers” in Italian). And of course, polymer artwork doesn’t have to be colorful to be beautiful. 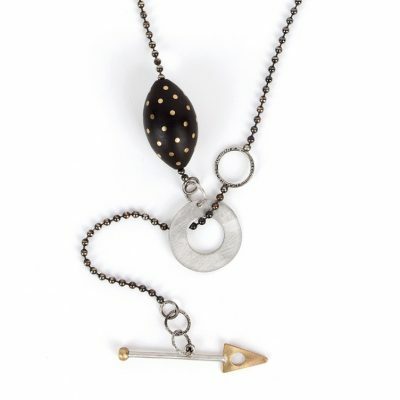 A simple palette of black and white makes a striking statement in these pieces by Grace Stokes, drawing attention to their rich, textural surfaces. 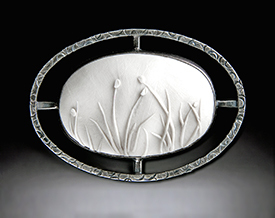 The white polymer evokes the purity and delicacy of porcelain. Polymer clay is also an excellent material to use for a trompe l’oeil effect—resulting in pieces so lifelike they practically fool the eye. 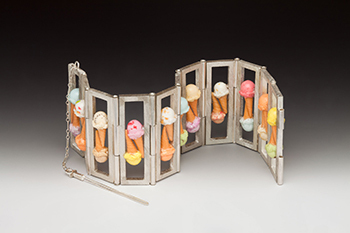 In her tiny, whimsical delectations, Carolyn Tillie expertly recreates the mouthwatering details of real treats—expressing her passion for food and her imaginative approach to jewelry. 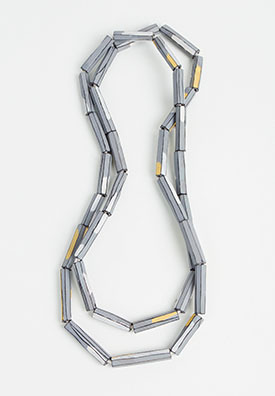 As polymer artists combine traditional techniques with brand new ways of working, they are able to create highly original jewelry in a limitless variety of styles: everything from intricate, colorful earrings to bold, geometric necklaces. 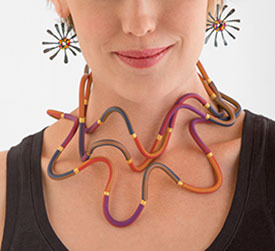 Add a bit of this dazzling creativity to your jewelry collection—discover the full breadth of polymer clay jewelry by innovative artists at Artful Home. I ve started experimenting with polymer clay, and I have to say, I love it! Here are some upcoming pieces! A very special custom order for a dear customer and friend, who commissioned this little army of lobstah rolls for a east coast flare charm bracelet for her mum! We stumbled over here by a different website and thought I should check things out. I like what I see so now i am following you. Look forward to looking into your web page for a second time. I quite like looking through an article that will make people think. Also, many thanks for permitting me to comment! It’s going to be end of mine day, except before ending I am reading this wonderful post to increase my experience. Hi. Of course share any of the articles you wish on Facebook. Very nice article. I certainly appreciate this site. Keep writing! Nice post. I was checking constantly this blog and I am inspired! Very useful information specially the last part 🙂 I handle such information much. I used to be seeking this particular info for a long time. Thanks and good luck.